The origins of Chinese music can be dated back to distant antiquity. Approximately 3000 years ago, European music was experiencing its first rustlings of life whereas a complete musical theory and sophisticated musical instruments began to appear in China, owing largely to the orthodox ritual music advocated by Confucius. 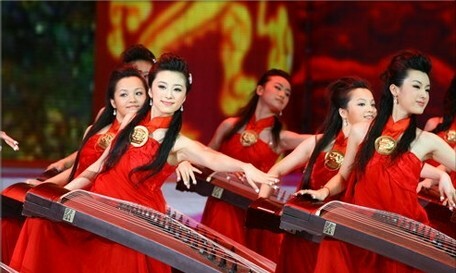 Chinese music is the body of vocal and instrumental music composed and played by Chinese people. For several thousands of years Chinese Culture was dominated by the teachings of the philosopher Confucius, who conceived of music in the highest sense as a means of calming the passions and of dispelling unrest and lust, rather than as a form of amusement. Chinese is a language family consisting of languages mutually unintelligible to varying degrees. Originally it is the indigenous languages spoken by the Han Chinese (hàn rén 汉人) in China, it forms one of the two branches of Sino-Tibetan family of languages. About one-fifth of the world’s population, or over one billion people, speak some form of Chinese as their native language. 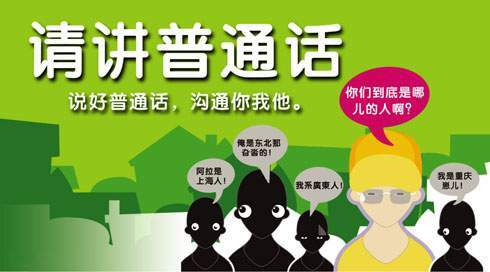 Besides Hong Kong Special Administrative Region, Macao SAR, Taiwan Province and the mainland of China, there are people in Singapore, Malaysia and some other countries speak Chinese as their mother tone. 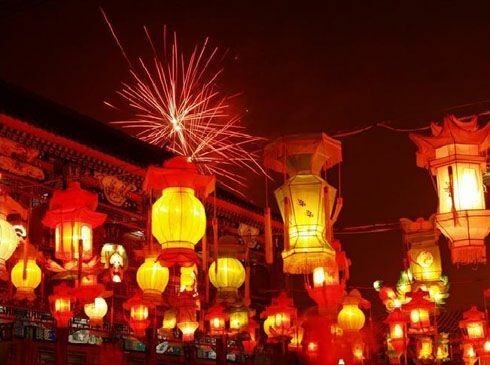 Fancy lanterns (dēng cǎi 灯彩), also called Colored Lamps (huā dēng 花灯), are special handicraft product of Chinese tradition which are widely used for decorations on festivals and holidays, weddings and other personal celebrations in China. According to statistics, fancy lantern was originated from the Western Han Dynasty (xī hàn 西汉) over 1800 years ago. When Lantern Festival (yuán xiāo jié 元宵节) comes, people will hang red lanterns so as to create a cheerful atmosphere. Afterward lantern became the symbol of joy in China. With its development, the lantern has formed abundant varieties and super craftwork level. 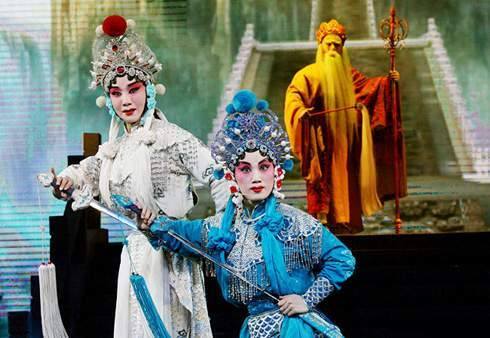 The folk of Lady White and Xu Xian (bái niáng zǐ hé xǔ xiān 白娘子和许仙) is one of the Chinese four greatest folklores. It reflects people’s recognition of love. The story goes like this: Taking the shapes of two women, White Snake (bái shé 白蛇), Bai Suzhen (bái sù zhēn 白素贞), and Green Snake (qīng shé 青蛇), Xiao Qing (xiǎo qīng 小青), toured on the West Lake (xī hú 西湖). A sudden heavy rain came at that time it sent everyone scurrying for shelter. When Bai Suzheng and Xiao Qing found their way, a young man holding up an umbrella protected them from the rain. The young man looked very handsome and gentle he was a local young scholar. Both Bai Suzheng and the young man flushed crimson with embarrassment when their eyes met together. They began to fall in love at that time. Seeing this, the clever Xiaoqing asked: "Thank you for your umbrella Sir, Could you tell us your name? "The young man replied: "My name is Xu Xian and I live in nearby the Broken Bridge (duàn qiáo 断桥)." Then Bai Suzheng and Xiaoqin introduced themselves to the young man. Residential construction in different parts of China is also called civilian residential housing which is a basic type of architecture. Due to the vast expanse of China, the presence of many ethnic groups, different climatic conditions and ways of life, the residences of people in different parts of the country differ in terms of design and style. The most representative civilian residences in China are the Siheyuan of Beijing (běi jīng sì hé yùan 北京四合院), Cave Dwellings (yáo dòng 窑洞) of the Loess Plateau (huáng tǔ gāo yuán 黄土高原) northwest China, the Earthen Tower (tǔ lóu 土楼) of Kejia (or Hakka) people (kè jiā rén 客家人) in Fujian (fú jiàn shěng 福建省) and Guangdong provinces (guǎng dōng shěng 广东省), and the Mongolian yurt (méng gǔ bāo 蒙古包) in Mongolian nationality. The earliest stone lion (shí shī 石狮) was discovered in a Eastern Han Dynasty tomb in Ya'an (yǎ ān 雅安), Sichuan Province (sì chuān shěng 四川省). 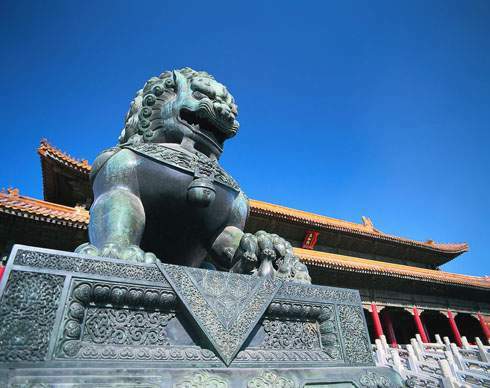 During the Ming Dynasty (míng cháo 明朝) stone lions were placed in front of palaces, government buildings, temples and even some rich family mansions to display power. Later, stone lion designs were carved as decoration on important architectural features such as door lintels and eaves. Beijing now has many stone lions made during the Ming and Qing (qīng 清) dynasties. These lions do not seem powerful and wild, but rather are kindly and gentle.